Peyton and I just got done using the Crayola Air Marker Sprayer and I must admit…it was so much fun! I’m not sure who had more fun. It is so easy to use. When I first saw the Air Marker Sprayer in the store I was a little nervous. I thought it would make a mess and be too hard for Peyton to use. But, it doesn’t make a mess and it’s super easy to use! The hardest thing about using the Crayola Air Marker Sprayer is getting it out of the box. Seriously, that was the toughest part. It’s very simple to use. Simply, plug the sprayer into an outlet, insert a Crayola marker into the slot, twist to secure the marker and press the trigger. Now you are using the air sprayer to color! It does take a little practice to get your technique down and learn how to handle the air sprayer. We learned if you hold it too close to the paper too much ink pools and then it starts to run under the stencil. I found out if I help it just a few inches away and moved the sprayer constantly I would get a nice even coverage. 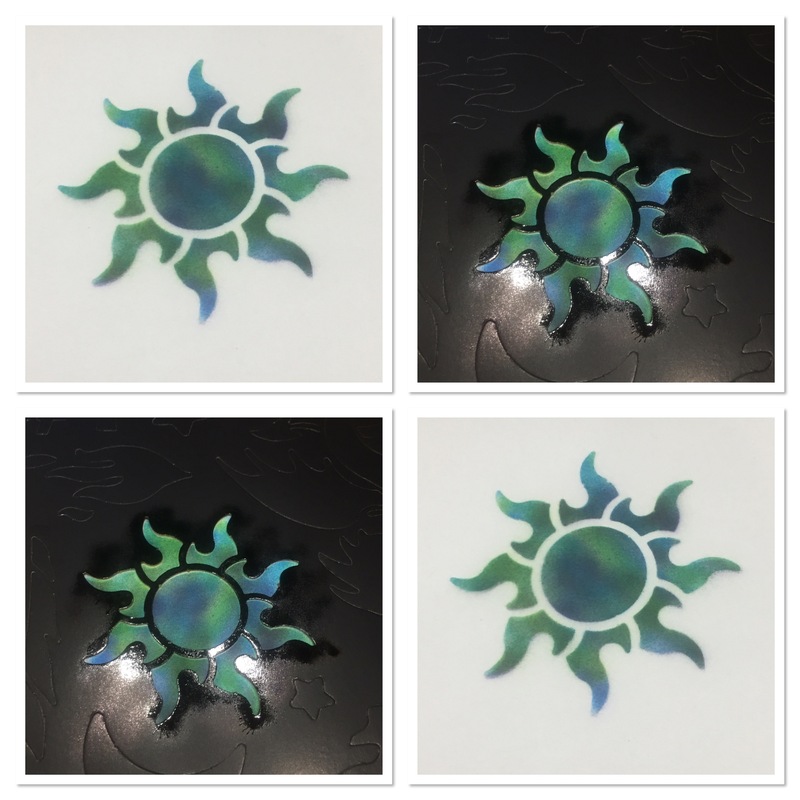 I did have to go over the area a few times if I wanted solid coverage, otherwise I would switch colors and go over the area again giving it a unique look. Peyton could have played with the Air Marker Sprayer all night if I let her. But she has chores to do, so one picture and we had to clean up. And clean up was a snap! There really is no mess with the Air Marker Sprayer. When we were finished I took the marker out, replaced the cap and that was it. No mess! You can use most Crayola markers with the Air Marker Sprayer. It needs the fatter ones like the Pipsqueaks or original markers, the thin markers will not work. The Crayola Air Marker Sprayer is recommended for ages 8 and up. Peyton is almost 7 and she could use it but only with supervision. 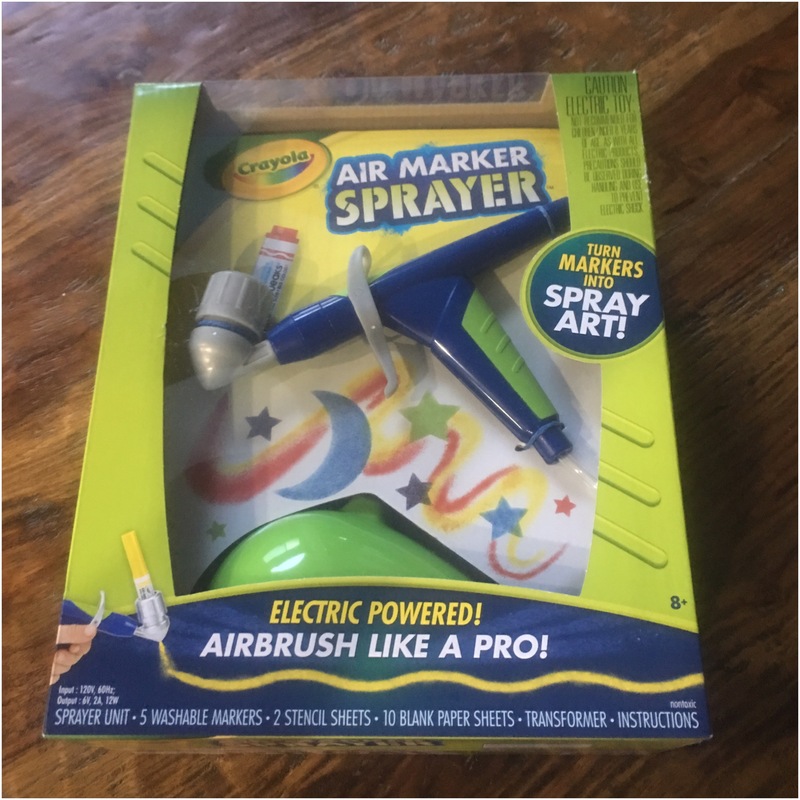 You can find the Crayola Air Marker Sprayer at your local retailer or online. 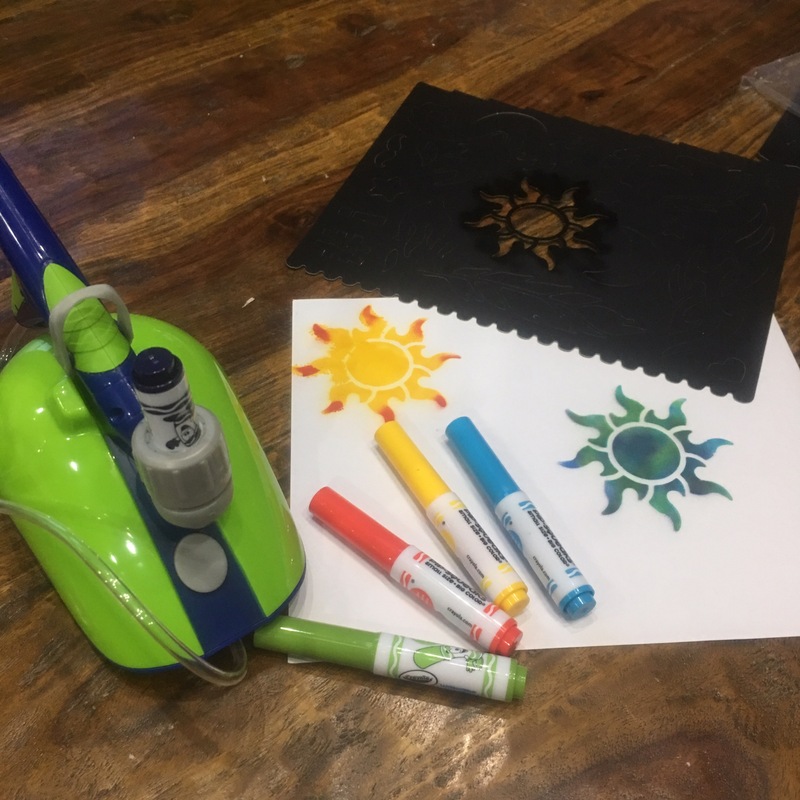 this looks really cool and fun way to do art and crafts for the kids. This looks pretty cool. I bet the grandkids would like one for Christmas. I love art and I was reading this and all kinds of ideas were coming to me! This is really cool.